The next edition of the Summer School will take place between 15 and 26 JULY 2019. APPLICATIONS OPEN! DEADLINE: 30 APRIL 2019. There are 80 places available. TU Delft will contact applicants after careful selection . 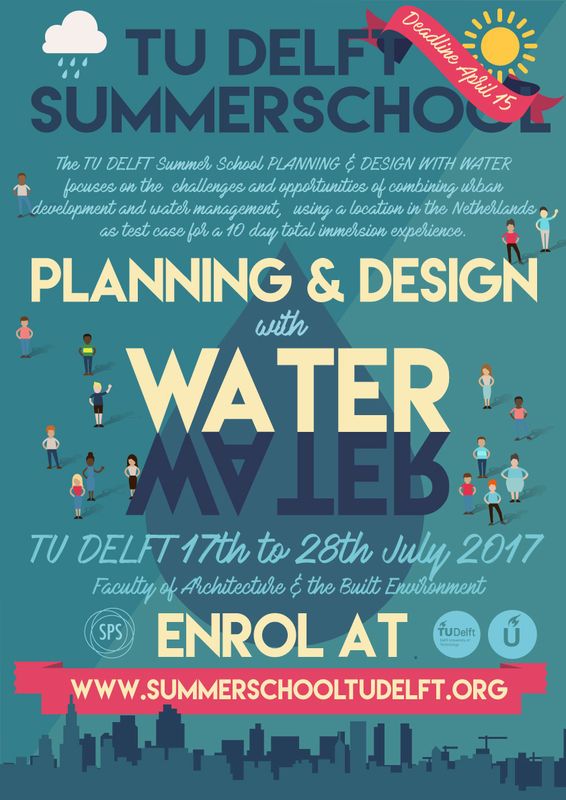 If you have any questions, please do not hesitate to write to Summer School TU Delft. 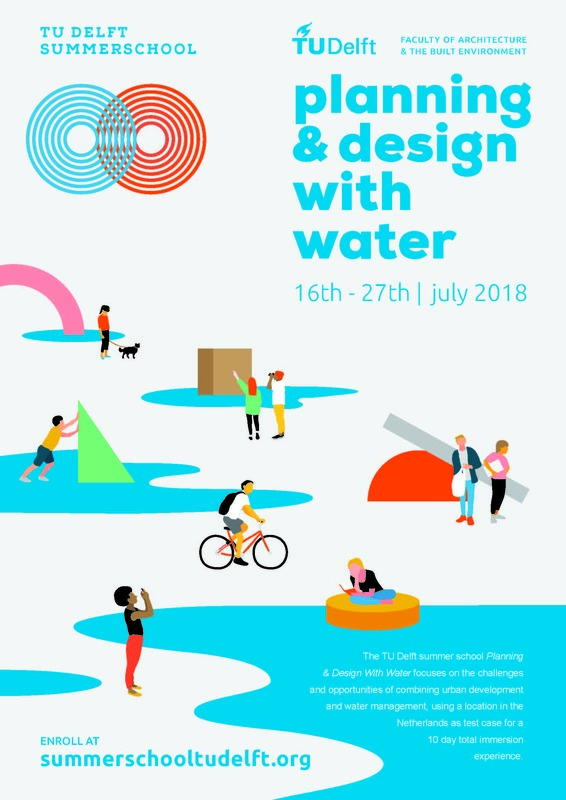 The Summer School Planning and Design with Water for Sustainability takes place every JULY at the Department of Urbanism of the Faculty of Architecture and the Built Environment of the Delft University of Technology (TU Delft). The Faculty of Architecture is located in the historic city of Delft, in The Netherlands. There have been 5 editions of the Summer School so far. The School is organised by the Chair of Spatial Planning and Strategy led by Professor Vincent Nadin, in partnership with international partners. In order to participate you need to be enrolled in a higher education course* [However, we also accept students who have graduated recently. Please, explain your situation in your letter of motivation]. The school is intended for 3rd year or up Bachelor or Master students (this means, students who have had at least 3 years of higher education in a discipline related to the built environment/ urban development). A planning, architectural or design background is indicated, but not necessary. The Summer School welcomes architects, urban planners, engineers, designers, geographers, historians, sociologists, engineers, environmental engineers, and students of other areas concerned with the built environment. However, you must be willing to understand URBANISM. We are looking for enthusiastic, entrepreneurial, open minded progressive students from all over the world who can help bring back ideas to their communities. There is only a limited number of places (80). Students will be chosen according to their background, a short motivation letter and a really short movie uploaded on the web. We cannot evaluate your portfolio or extensive CV. Therefore, it is really important that you explain why you want to participate in this summer school and how it can help your PERSONAL, ACADEMIC and PROFESSIONAL development in the motivation letter. You can tell us what makes you special by letting us know what are your passions, interests, hobbies and extra-curricular activities. Why are you different? Do you have interesting hobbies? Are you an activist? Do you make your opinions known by writing and publishing or by any other means of expression? Maybe you have a BLOG? You need to make your point in 800 words and in 3 minutes of film. The language of the Summer School is English, hence you need to be able to communicate well in that language. You need to mention what your level of proficiency in English is in the motivation letter. This is important, because the vocabulary we use at the Summer School is rather sophisticated, hence you will not enjoy it if you don’t speak English well. The fee for the 2018 Summer School is 400 Euros. Payment instructions will be sent to students who have been selected to participate in the Summer School. There are a few scholarships available and they are explained HERE. Your participation fees cover all activities connected to the Summer School, including social activities, a number of meals, materials, site visits and the final certificate. Fees do not cover accommodation, travelling costs and your normal meals. Students must pay for their own accommodation and food. TU Delft advises you on how to find accommodation in Delft for the period of the Summer School, but you are responsible for finding accommodation. You must be in Delft at least one day before the beginning of the Summer School and you may leave after the delivery of certificates. We often get asked why this Summer School is so cheap compared to similar schools offered by other top universities. We keep a low-fee policy because we do not want to “select” participants based on their ability to pay. Our goal is to have a diverse, dynamic group of students who are future leaders in their communities. Moreover, we do not provide accommodation. We believe students are really good finding their own accomodation (friends, Airbnb, hostels and other solutions). Nationals from the European Union, Switzerland Norway, Canada, US, Australia, Brazil, Argentina, Chile and many other countries do not need a VISA to enter the Schengen Area. You can check if you need a visa HERE. TU Delft provides invitation letters for foreign students who need to apply for a visa after careful investigation. However, TU Delft is not responsible for the granting of the visa. Only the Dutch authorities may grant you a visa, at their discretion. We advise you to get information about visa requirements at the Dutch Consulate website of your country of origin as soon as possible. Visa applications might take some time to complete. You can get basic information about student visas HERE. Again, TU Delft is not responsible for the delivery of a visa to you. The Dutch visa allows you to travel within the Schengen Area. Note that this area does not include the UK, Ireland and other countries in the European Union. The Schengen area includes most EU states, Iceland, Liechtenstein, Norway, and Switzerland. Please, make absolutely sure you know what kind of visa, if any, you need. Please, read the information on the website carefully. Please, read the online form carefully, so you know what texts you need to prepare and what documents you need to apply. Fill in the form below carefully and as completely as possible. We cannot process your application without the information required in the form (if you do not have a passport at this point, please write “will provide later”. Copy and paste your motivation letter to the specific field in the form, as well as the answers to specific questions. Make a very short (3 minutes maximum) video with your phone or camera and send it to summerschool-bk@tudelft.nl via WETRANSFER (this transfer service is free) . In this video, you can introduce yourself, tell us where you live, where and what you studied, the main challenges you see in your city and add a few words about why you wish to participate in the Summer School. ** If you cannot visualise the form, please make sure that you are able to access Google services from your country. Alternatively, please try this LINK.